FBW7 is downregulated in human CRC. (A) Representative images of RNAscope for PPIB and FBW7, and FBW7 IHC on serial sections from human TMAs. u.d., undetected. Scale bars: 10 μm. (B) Quantification of FBW7 mRNA on CRC TMAs in 28 tissue cores positive for a control PPIB mRNA. (C) Quantification of FBW7 IHC in tissue cores from A. (D–F) Endogenous FBW7 interacts with endogenous USP9X and USP9X interacts with endogenous FBW7 in HEK293 cells. Black line in D indicates noncontiguous lanes from the same gel. 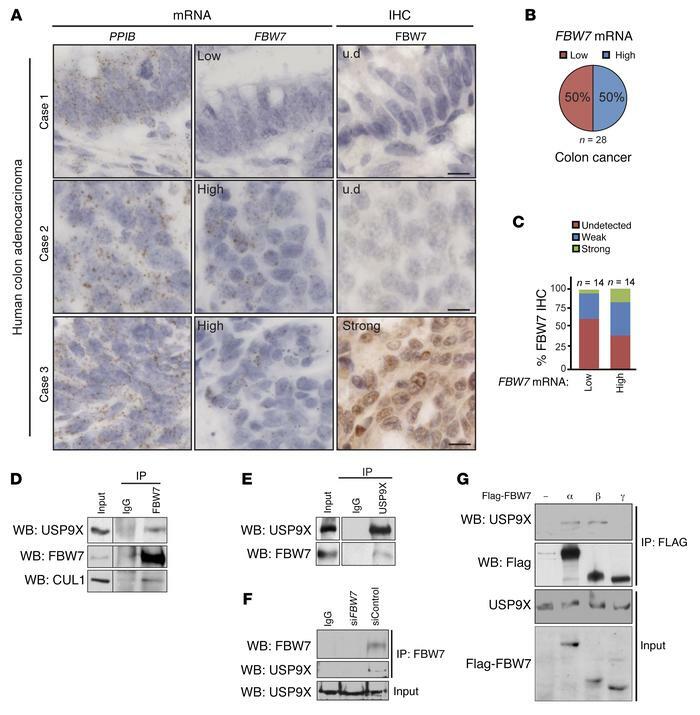 siFBW7 control in F confirms antibody specificity of FBW7 and represents a negative control for FBW7-USP9X interaction. (G) Endogenous USP9X interacts with epitope-tagged FBW7 isoforms α and β.